The 8th annual Diamond Chefs Gala will be held on Thursday, May 8, 2014! Join us for this fun and wonderful evening that will include a four course gourmet meal with wine pairings, entertainment, and a silent and live auction. The Gala’s four 2013 Diamond Galacourse dinners will be prepared by the Hilton Diamond Chef and our very own TSD Culinary Arts Students! This is a great opportunity for the students to get real hands on experience while helping their school. Each course will be accompanied by a glass of wine, hand-selected and donated by St. Michelle Winery. A VIP reception, for sponsors at Diamond ($5,000) and Amethyst ($2500) levels, will be held from 5:00 – 6:00PM in the Hilton’s VIP Room. Dress for the evening will be “Austin Chic”. 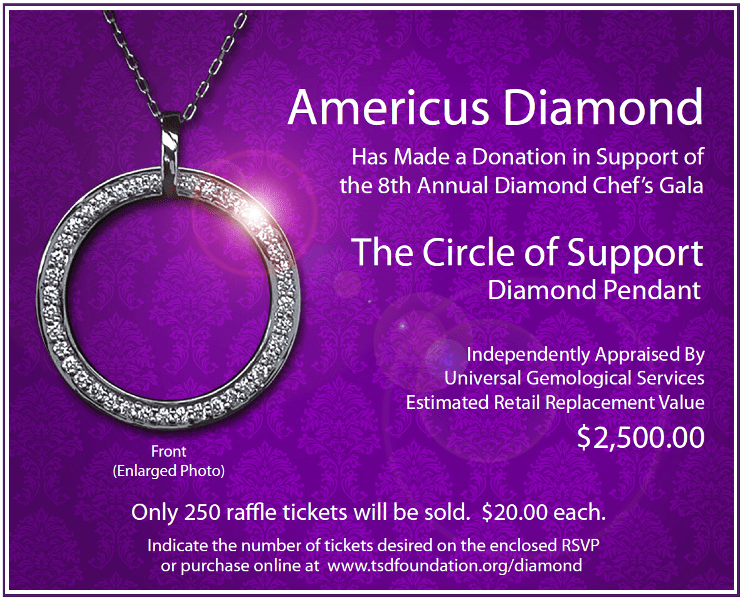 This year, we are also raffling a beautiful $2,500 diamond pendant necklace, donated by Americus Diamond San Antonio. Raffle tickets are $20 each. We are only selling 250 raffle tickets, so purchase your raffle tickets early! You do not need to be present to win. Pendant Necklace. If you purchase a raffle ticket online, we will write your information on the raffle ticket and will send you a copy of your ticket. You do not need to bring the copy of the raffle ticket to the Gala. If we have any tickets remaining on the night of the Gala, you may purchase additional tickets onsite. Remember, there are only 250 raffle tickets for sale! All proceeds of the Diamond Chef Gala go to the TSD Foundation and our mission to give each deaf and hard of hearing child in Texas a chance to learn, grow and belong. Purchase tickets, raffle tickets or become a sponsor today!